Last year i tried few Bengali dishes to share a lunch menu collection. 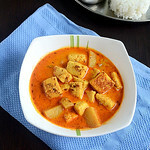 I posted few dishes from the menu and this recipe was in pending list.Today when i was checking my drafts,i found this post lying in the folder.Chanar Dalna is an authentic vegetarian Bengali dish served for rice.It is made using potato and freshly prepared Chenna/homemade paneer.But i used store bought paneer and referred Sanjeev Kapoor’s recipe.Its a no onion no garlic recipe too.It came out pretty well.This weekend i will share the Bengali lunch menu platter.Now lets see how to make Bengali style Chanar Dalna Recipe – Vegetarian version ! 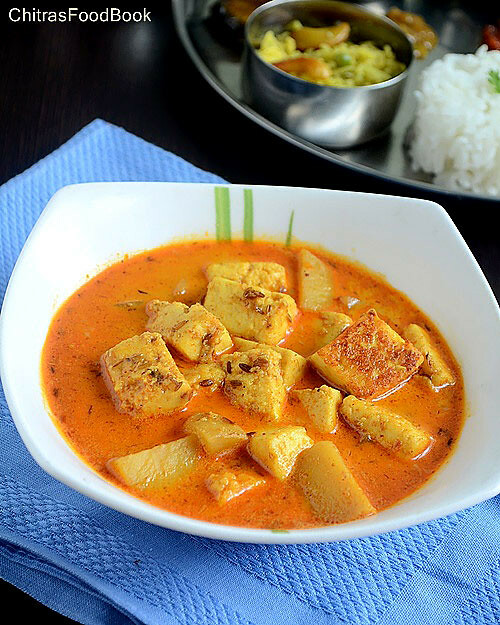 Cube cut paneer and Peel potatoes,cube cut it.Slit the green chillies and chop the ginger into small pieces.Grind 1 tsp of cumin seeds,red chilli powder,turmeric powder and ginger into a smooth paste adding little water. Heat oil and deep fry or shallow fry paneer cubes till it turns light golden brown.Set aside.In the same oil,fry the potato cubes till light brown and keep aside. In a kadai heat ghee and add 1/2 tsp of cumin seeds.Add the potato cubes,slit green chilli,,tomato pieces(if using)ground masala paste,garam masala powder,sugar and saute well for 2-3 minutes without burning the masala.Add the required salt and half cup of water.Cover and cook the potatoes. 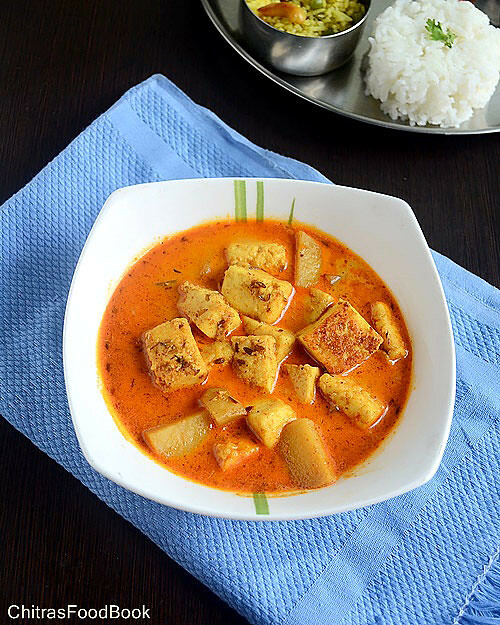 Lastly add the milk and fried paneer cubes.Check for salt and simmer the gravy for a minute.switch off the flame. Serve hot with rice. Some recipes called for tomatoes too.so if you wish,you can add 2 small roughly chopped tomato and saute until mushy before adding masala paste. This gravy is supposed to be watery.So add water and milk accordingly. You can skip milk and add water alone. 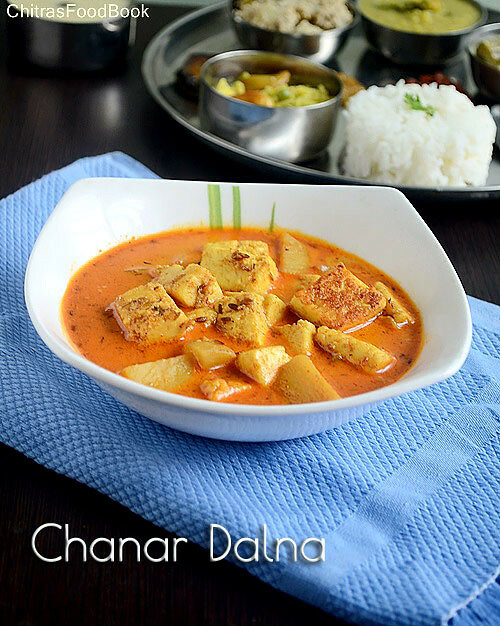 Enjoy this Bengali style Paneer gravy – chanar dalna for rice !! I Like Your Delicious Recipes,i like paneer,really amazing foodies..